Access the resource with everything you need to set up, revise, terminate and manage a pension plan, day to day. Pension Plan Guide is your complete, core guide to creating and managing a pension plan, from beginning to end. The Pension Plan Guide covers the rules affecting retirement benefit plans, delivering expert analysis and explanation of the law, as well as key cases, rulings and legislative developments. The Guide provides the full text of the Employee Retirement Income Security Act of 1974 (ERISA), plus ERISA regulations and Committee Reports. Rulings and releases from the IRS, PBGC, DOL, SEC and other federal agencies are also included. 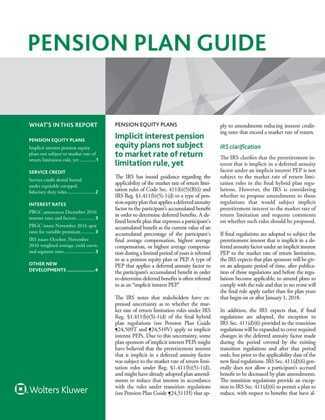 Along with the Guide, you will also receive the weekly Pension Plan Guide Newsletter. It is the ideal resource for keeping current with pension benefit developments. IRS Releases: Revenue Procedures, Revenue Rulings, Announcements, etc. DOL Releases: Opinion Letters, VFC, Technical Updates, etc.